The Netflix Original series "Orange is the new Black" brings Season 4 to Blu-ray, a season which saw many things change and some surprise guest starring roles. With so many great stars this show doesn't only have spectacular storylines, but surprises with the support that it gets from many actors. If you want to win this on season, follow my Twitter: @Thisfunktional and tag me in a tweet where you share this contest and use #Thisfunktional. I will DM the winner, thats why you have to be following. Disclaimer: 3 winner will be chosen. Contest runs to May 08, 2017. Winners will be notified on May 08, 2017 with instructions on how to claim your prize. No purchase necessary. Prize provided by MPRM Communications. Only open to the U.S., no PO Boxes or international addresses. 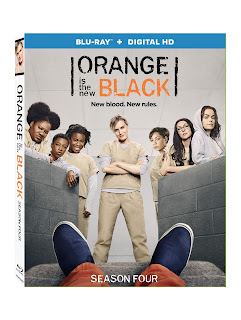 The drama in Litchfield is “better than ever” (The Boston Globe) in the fourth season of the groundbreaking hit series "Orange Is the New Black: Season Four," arriving on Blu-ray™ (plus Digital HD), DVD, and Digital HD May 9 from Lionsgate. From Jenji Kohan, the creator of Weeds, Orange Is the New Black is a thought-provoking, funny, and evocative show about life in a women’s prison. Based on the best-selling memoir by Piper Kerman, the newest season of "Orange Is the New Black" delves into the racial and economic tensions that run rampant in the halls of Litchfield. Overrun with new inmates and overseen by inexperienced guards, the prison undergoes an unprecedented culture war. Timed to the series’ Season 5 premiere, the "Orange is the New Black: Season 4" Blu-ray, DVD, and Digital HD release includes all 13 episodes, as well as exclusive bonus material that fans can’t find anywhere else, such as a featurette that takes viewers around the set of Litchfield Prison, a gag reel, and selected episode commentary from cast and crew. The "Orange is the New Black: Season 4" three-disc Blu-ray (plus Digital HD) and four-disc DVD will be available for the suggested retail price of $34.97 and $34.98, respectively.